This guide is for the maze game. For the adventure game, see Ali Baba and the Forty Thieves. Ali Baba and 40 Thieves is an arcade game that was released by Sega in 1982; it runs on Namco's Pac-Man hardware (a Zilog Z80 microprocessor running at 3.072 MHz), and is based on the folk tale of the same name. It was later ported to the MSX platform in 1984 - and a Vector-06C port based on the MSX version was later released. 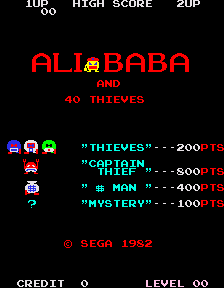 The player must utilize a four-way joystick, to take control of the eponymous Ali Baba who must fend off and kill the forty thieves as they try to steal his money; at the start of the game, Ali Baba goes into the room at the top of the screen as that text "OPEN SESAME" appears above him, grabs the seven bags of money and takes them down to the room at the bottom of the screen. He will now have to "hit" each of the forty thieves as they enter the room - but if one of them should make it to the room at the bottom of the screen he will pick up one of the seven bags of money then try to take it back up to the room at the top of the screen. If the thieves take all seven of the money bags up to the top of the screen, it will cost Ali Baba a life; but, if he "hits" all forty thieves without this happening (except the large and invulnerable red one), he will proceed to the next level. This page was last edited on 16 February 2014, at 16:58.